What Does an Otorhinolaryngology Nurse Do? Where Do Otorhinolaryngology Nurses Work? What Is an Otorhinolaryngology Nurse? An otorhinolaryngology nurse - also known as an ear, nose and throat nurse - cares for patients with diseases or injuries of the ear, nose, throat, head or neck. Often referred to as ENT nurses, otorhinolaryngology nurses assist in the treatment of both acute and chronic conditions, including ear infections and allergies, laryngitis, sinusitis, tonsillitis, sleep apnea and injuries such as broken bones. ENT nurses treat all ages of patients, from infants to the elderly, with a sizable pediatric patient population. Aspiring otorhinolaryngology nurses must first complete their Associate's Degree in Nursing or Bachelor of Science in Nursing degree and pass the NCLEX-RN exam. Specializing in otorhinolaryngology requires a strong knowledge of the ear, nasal passages and throat and how these areas interact with one another. Additionally, as a number of ENT patients are children, courses in pediatrics and experience working with children is particularly useful. Once a nurse has a valid RN license, he or she can begin working in a number of related fields to gain experience in otorhinolaryngology, such as otology, audiology, laryngology and rhinology. Once a nurse has worked for three years in an otorhinolaryngology setting, he or she may then sit for the Otorhinolaryngology Nursing Certification exam offered by the Society of Otorhinolaryngology and Head/Neck Nurses. To search and apply for current otorhinolaryngology nurse positions, visit our job boards. What Are the Education Requirements for Otorhinolaryngology Nurse? A position as an otorhinolaryngology nurse requires an ADN or BSN degree in addition to an active RN license. Coursework in the anatomy, physiology and diseases of the ear, nasal passages and throat are particularly critical for nurses interested in otorhinolaryngology. 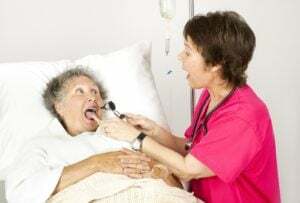 After working as a registered nurse in otorhinolaryngology for three years, a nurse can sit for the Otorhinolaryngology Nursing Certification exam offered by the Society of Otorhinolaryngology and Head/Neck Nurses in order to become a Certified Otorhinolaryngology Nurse (CORLN). While an RN can begin work as an ENT nurse as soon as he or she completes their nursing degree and attains an RN license, the Otorhinolaryngology Nursing Certification offered by the Society of Otorhinolaryngology and Head/Neck Nurses is highly desired for career and salary advancement as an otorhinolaryngology nurse. In order to sit for this exam, it is recommended that an RN have a minimum of three years' experience in an ENT setting. Otorhinolaryngology nurses assist in the assessment, diagnosis and treatment of patients with various diseases and injuries of the ears, nose, throat, cranial nerves, skin and neck. They often perform and assist with examinations of the ears, nose, throat, head and neck using tools such as tongue depressors, otoscopes and specialized mirrors. They also collect samples from the affected area and record symptoms and vital signs, which are then used in pinpointing a diagnosis. They also assist with treatments, such as administering medications, educating patients about home care for their conditions and providing support for patients undergoing medical and surgical procedures that concern the head and neck. What Are the Roles and Duties of an Otorhinolaryngology Nurse? Otorhinolaryngology is a highly specialized field of medicine, and as such, nurses with experience and knowledge of ENT care are in demand. According to the Bureau of Labor Statistics, the median annual wage for registered nurses as a whole was $68,450 in May 2016. However, for nurses who specialize in specific areas, such as otorhinolaryngology, that annual salary may increase depending on education and experience level.